( nr. 370 ) - West Indies or CARRIBEAN - between North and South America. Drug cartels. Colombian Medellin and Cali cartels. 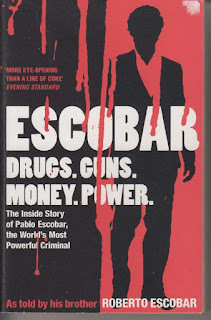 A book " ESCOBAR - drugs. guns. money. power." - as told by his brother Robert Escobar. 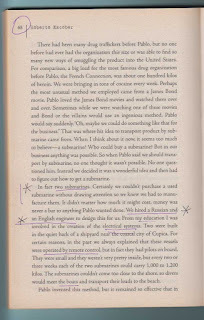 Roberto is almost blind, and the copyright is for two people: Roberto Escobar and David Fisher 2009. 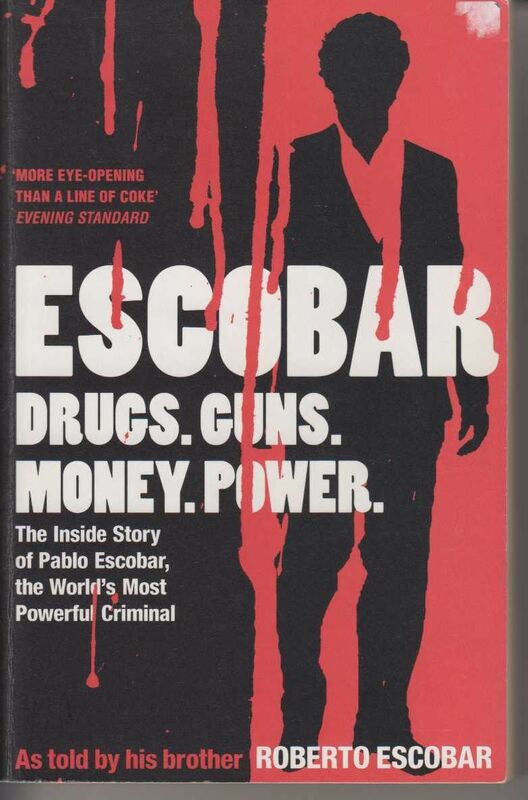 Very good book, written as a free flowing speech from Robert Escobar, but I wonder why on page 262, for example, Roberto mentioned " ... my lawyer, Enrique Manceda " and Cali cartel's " ... Their lawyer, Vladimir ". Only first name Vladimir? Pablo Escobar himself studied Criminal Law. 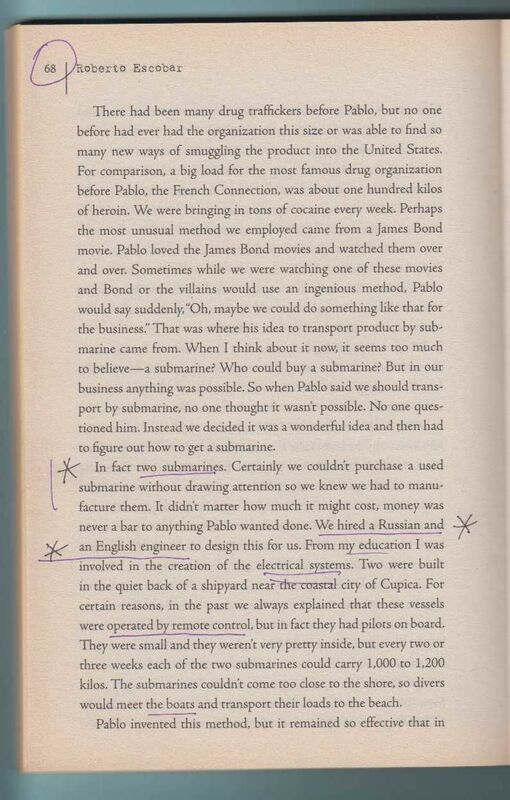 Victor Bout used submarines for gun and drug trafficking. - A Russian and an English engineer were hired to design a remote-controlled submarine. - In 1984 a deal with Nicaragua gov. 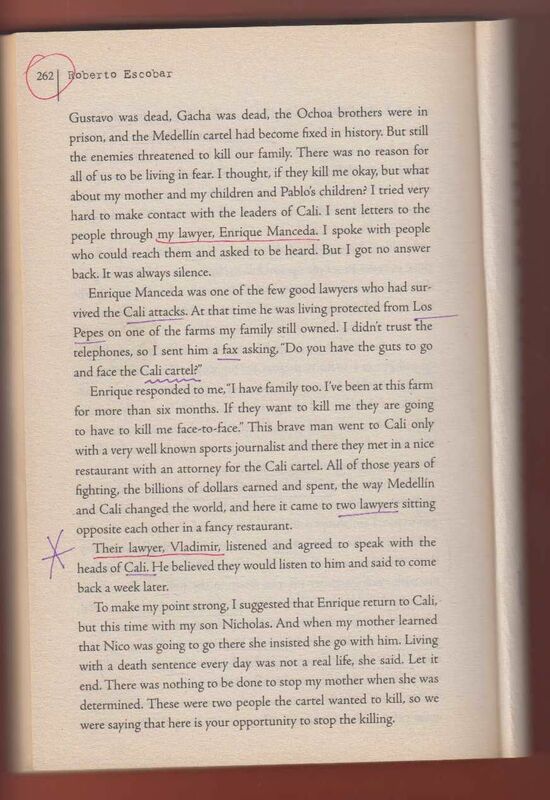 - In PANAMA a general worked with Medellin cartel. - In Haiti another powerful general worked with Pablo. - Five young Brazilian dancing girls were used to 'entertain' Vladimiro Montesinos, the chief of Peru's intelligence service (who came to visit Pablo Escobar). - Jacqueline Kennedy Onassis ( in a French restaurant). [ Friday, 24 Feb. 2017] - So, there is a second name/lawyer (as above) associated with Klaas Otto. I almost failed to find Peter R. de Vries ( Dutch investigative journalist) online as only another man - American Peter de Vries (no middle R.) was there. YOUGOSLAV mafia in Holland ? Recent online language such as Trump being un-American when he spoke about Russian sanctions, made me listen to his talking to journalists, where I detected some similarity ( tone of voice, etc.) with Serb polititian, who was very dismissive about BBC, for example. And of course, similar phrases and body language of M. Obama and M. Trump (that video quickly disappeared). There were may be two helicopter escapes of imprisoned criminals from Scheveningen prison organized by Arkan (?) . Underaged prostitute (photo somewhere) whom I saw here in Gosport ( names: Atic C., Ukranian woman and 'Indian' man acting as her pimps? ). 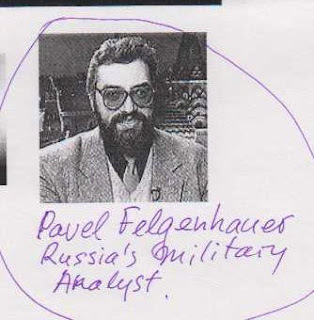 There was also a 'hunk' Yougoslav lawyer visiting from Paris, old Serb Gypsy singer at a restaurant near CS Den Haag and of course, Fetahovich family as family friends. Dutch hard criminal Holleeder ( one of his sisters published book about him: "Judas") was involved in the kidnapping of Heineken (beer) owner, murdered at least 25 (?) people. A year ago he came into the house of Peter de Vries and was threatening him in front of his wife, demanding that he and another American journalist stop negative publicity about him - just like Klaas Otto ... .
English word Pub (drink and eat place) is short for Public house. If translated into Russian as Poublichny Dom (literally) it means Whore House or Bordello. Locally I heard that historically pubs were built opposite/near Christian Churches. Interestingly Holleeder provided some information in secret (? ), which was left out of his case files. By whom? The disappearance of American teenager Natalee Holloway was intern. news a few years ago. Yeroon van der Sloot is the son of a Dutch lawyer and his wife, Arts teacher. The moved to ARUBA island in Caribbean. Peru, Aruba, International School, ... . The video sound is unblocked - in "my" channel, anyway. There was some strange new Post-Soviet lingo - new Russian words SOVOK (fem. SOVKA as in BRAT film) and BORODEYKA. Seemingly new meaningless words. Sovok was (early 1990s) taken abroad to mean Post-Soviet official or person who was particularly unworldly, continuing to live in Communist system abroad. Some word play: sova - owl, sovok - small spade, scoop. PS: some real life stories ( bordering on ?) indecency about poking/shoving fingers (ref. very old men). [ Mon. 27 Feb. 2017 ] - I leave the sentence above with gram. error as it is. 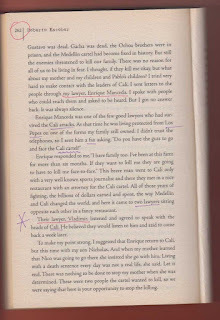 Scans (3) posted: Escobar book front page and pages 262 and 68: about VLADIMIR ( Cali cartel lawyer) and Submarines (ref. RUSSIAN and ENGLISH engineers). Russian and American mil. were to meet in BAKU on Thursday, - which Thursday? Krisztina Marfai Arib. Lived in Israel aged 17-19, etc. MICHAEL D. COHEN - personal US president D. Trump's lawyer has a Russian/Ukranian (?) wife. Scant and disputed info online about his family so far. [ Tue. 28 Feb. 2017 ] - talked to "The News" downstairs minutes ago. Adam (?) in a black Peugeot 206 by Asda (said he was not a journalist, but an IT man) whom I spoke to yesterday, has not been heard from. In that 'package': a 'forbidding' old woman in 'leopard' raincoat coming from a Shamrock Close, a woman walking a Rotweiler (fattened) by the Gosport Lake, a woman running from Nelson bld. to catch a bus ( I made some anthropological guesses about), etc. Yes, as Kay Griggs, American Naval wife said, THEY like bouga-wouga (sp? ), celebrations, anniversaries .... . Numerology is part of it. As I pondered about October 4 in 1992 and 1993 events in Holland and Russia (link below), there is a mathematics there: 410, 510, 610 and 710. Heretics in Russia - Piatidesiatniki ( 510 or 5-10 or 500+10 ). And there was a 'special' school 57 in Moscow. I went to a 'special' school 710 ( we called ourselves semidesiatniki) . Did Leonid Timochouk go to Shkola 57 ? Can't remember. Small change in 510 above. Taxi name or tel in Gosport: 710-500. Posted scan ( orange frame) from "Sun" of yesterday, p. 6 - articles by Harry Cole: Trump dinner guests and Hezeltine vs Theresa May and Amber Rudd. Visitors from Russia to Holland: St. Petersburg, Moscow, Tumen, Omsk, Perm, Volgograd, etc. Ralph Cohn's neighbours in Skipton (number 5? )- first re-emigrants from Australia, then a man from Scotland with two dogs. Number 7 - Dutch/German-like man with a (half?) Spanish wife and two daughters. Raphael Cohn did Engineering in Oxford (?). I asked David Cohn why he wanted me to do eng. calculations for a deep underground project in his house in Bradly Village, as I am not an engineer. His friend already had deep underground heating system- ALL NEXT TO ECHELON - Menwith Hill American-British Air- base. [ Wed. 1 March, 2017] - Kay Griggs, American Naval Wife, also said, that THEY have never been enemies with the SOVIETS. [ Friday 3 March, 2017 ] - Why is there such a fog/anonymity (?) about Russian/Ukranian (?) wife of Michael D. COHEN, personal lawyer of American President DONALD TRUMP ? Ref: Lloyds Bank's fraudulent procedures - mysterious Victoria COHEN - 'forced' automatic deductions .... Where did my money go ? [ Sat. 4 March, 2017] - Just added photo of Russia's Military Analyst Pavel Felgenhouer, because all his Wikipedia entries have no photos of him and a rather short. The search for his images produced smb. barely recognizable - may be his double or some beauticians and hairdressers did a wonderful job. I remember reading about Dutch FPM Ruud Lubbers, who had some cosmetic correction done on his teeth and .... his wife did not notice the difference. JORDAN: Ten IS terrorists were executed early morning today. I am not with these people ! There was no name-logo-identification on musicians' t-shirts or their drums, so I asked around and the responses only raised my doubts. They had 'Big Noise community band' on their backs and a stern looking woman (their leader?) who came up to me to ask 'what the matter was' had SAMURAI logo on her yellow t-shirt. Remembered African Diaspora Day in British Museum, which was de facto boycotted by Africans and Afro-British. I have some photos posted from that day on this or another site of mine. I came back to the library to make this update, as I think the drummers might have heard about The Dutch Sisterhood Halloway. 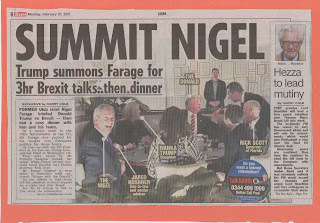 met Nigel Hughes in Ikoyi Club shortly afterwards. 2. Mitchell and Illiffe (sp?) - 'bookmakers' - Gosport High Street. Could not find it yesterday. 3. P&O Stena Line - ferry between Dover in UK and Hook van Holland in Netherlands. Diana and Vanessa visited us in Ommen, Overijsel, Holland. She met a nice young woman (Josephine?) whose gypsy (Dutch Gypsy) family we all met (went to visit) in Alphen-aan-de-Rijn. Link to my post from last year Tech - Mafia - 2. [ Tue. 7 March, 2017 ] - HOLLOWAY ! - I missed Holloway in (2) above. phoned and said they needed ( only) an invitation to Holland and won't be any trouble, as they had a place to stay. Invitations were with an undertaking that I'd have had to sign, etc. I said No. I kept misreading some High Street signs in Gosport: Illiffe as Ile-Ife, Betfred as Betreft, Slot as Sloot. One "Garry CUNNINGS - supervisor" made a fool of himself outside and inside Fareham Shopping Center (today at 11.30). When I asked him if he had some Eastern European or Russian/Ukranian roots, he only kept saying: What does it matter?! Made me wonder about "Russian Sailors in Isle of WIGHT", as I wrote about it previously, one or two years ago. American teenager Natalee Holloway went missing in ARUBA (West Indies) in 2008. PETER R. de VRIES investigated this crime extensively. Watched some videos. I remember I wanted to vote for Peter R. de Vries (or his Party) from UK. The online voting was blocked. How many people were frustrated? The "bug" was either in programming or caused by outside non-friends. I any case his score was very good. [ Thurs. 9 March, 2017 ] - MALYSHEV - Alexander Evg. (born 1919) - Soviet diplomat - since 1946. 1. 1949-1952 - work in Soviet embassy in Bulgaria. 2. 1954-1958 - Soviet embassy in Yougoslavia. 3. 1963-1964 - Soviet embassy in Czechoslovakia. 4. 1964-1969 - Soviet embassy in Tunis. 5. 1972-1978 - Soviet embassy in Cameroun. Fareham Shopping Centre - Management Office - 28 Thackeray Mall, Fareham, Hampshire, PO16 OPQ. A whole lot of BLACK CURTAINS and VERY DARK WINDOW GLASS in the whole building. Sub-lettings, may be? Not good for eyesight, office work or energy consumption.